Personalize your entertainment with Cox Contour on your TV or on your tablet with the Contour app! 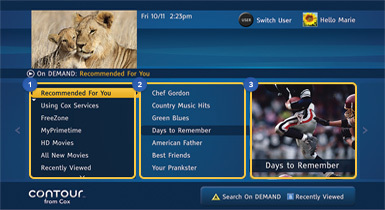 Watch your favorite shows and Contour will recommend new shows based on your preferences. Select the Genre or Network. Make your show selection and choose “Watch Now”.